Saddam Hussein has distributed $260,000 to 26 families of Palestinians killed in 29 months of fighting with Israel, including a $10,000 check to the family of a Hamas suicide bomber. In a packed banquet hall on Wednesday, the families came one-by-one to receive their $10,000 checks. A large banner said: "The Arab Baath Party Welcomes the Families of the Martyrs for the Distribution of Blessings of Saddam Hussein." That's a small fortune in poverty-stricken Gaza, reports CBS News Correspondent Robert Berger, and the donations have made him a hero on the Palestinian street. Israel accuses Saddam of financing Palestinian terror. The money — handed out by the Arab Liberation Front, which is affiliated with Saddam's Baath Party — was distributed as the United States tried to get U.N. Security Council support to use military force to disarm Iraq and oust Saddam, who the United States says supports terrorism. Among the families receiving checks from Saddam's charity were those whose children and relatives were killed in Islamic Jihad and Hamas attacks. Both groups are on the U.S. State Department list of terrorist organizations. Other families had relatives killed during Israeli raids on Palestinian towns and refugee camps. Iraq gives $10,000 to the families of those killed within 30 days of death. In total, Saddam has given more than $35 million to West Bank and Gaza Strip families of Palestinians killed during the fighting, said Ibrahim Zanen, spokesman for the Arab Liberation Front in Gaza. Initially, families of suicide bombers received $25,000 from Saddam, but now everyone receives an equal $10,000. 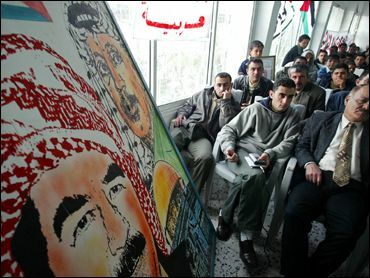 "President Saddam considers the Palestinian people as part of his Arab nation. Both of us, the Iraqis and the Palestinians, are in the same trench facing an ugly aggression," Zanen said. "The President considers this small gift to the families as just a symbol of support for those who have reached the highest degree of martyrdom." "It shows that Saddam is involved in every activity that is terrorism and murderous and leads to instability in the Middle East," counters Amira Oron, a spokeswoman for Israel's Foreign Ministry. Many Israelis and Palestinians agree that the United States, after ousting Saddam Hussein, will finally focus on ending 30 months of bloodshed and renewing peace talks. The idea of a powerful U.S. intervention is dreaded by those who oppose politically and ideologically difficult concessions — such as a settlement freeze by Israel or a crackdown on militants by the Palestinians. However, U.S. engagement is eagerly anticipated by those who conclude that, left to their own devices, the two sides will remain mired in a bloody cycle of violence. Others dismiss such hopes as wishful thinking, arguing that the main reasons for the impasse will remain even after Saddam. Meanwhile, a foreign worker advocacy group claims Israel has been selling expired gas mask kits to foreign workers, including a nerve agent antidote that has also expired. The kits — which include a gas mask, filter and atropin injections — are sold to foreign workers for 200 shekels ($41) in preparation for a U.S.-led war on Iraq and the possibility that Saddam Hussein will use biological or chemical weapons against Israel. Israel distributes gas mask kits to its citizens for free and asks that people with kits dating back to 1984 exchange them for newer ones. The kits sold to foreigners date back to 1982. The Defense Ministry said in a statement that the kits provided foreigners were found to be valid for at least another six months. The statement also said that the kits provided to Israelis were different in that they had a longer shelf-life "to prevent the need (by permanent residents) to renew the kits often." A Defense Ministry spokeswoman confirmed that the gas mask kits provided to foreigners were past their expiry date. But the spokeswoman, who asked not to be named, said that the kits were still good. Adi Laxer, of Kav La'Oved, a workers' advocacy group, said atropin, like any other medicine, can cause health complications once it expires. The gas mask filters, too, become ineffective after time. "They are giving foreign workers the garbage the Israelis are throwing away," Laxer said. During the 1991 Gulf War, Iraq fired 39 Scud missiles at Israel — all of them with conventional warheads — causing heavy damage and panic but few casualties. Israeli officials have downplayed the threat of Iraq attacking Israel. Israel has an estimated 300,000 foreign workers, most from Eastern European, African and Asian countries. About half of them are illegal.